We publish Action Plans to provide our members with a variety of options for advancing their feminism. 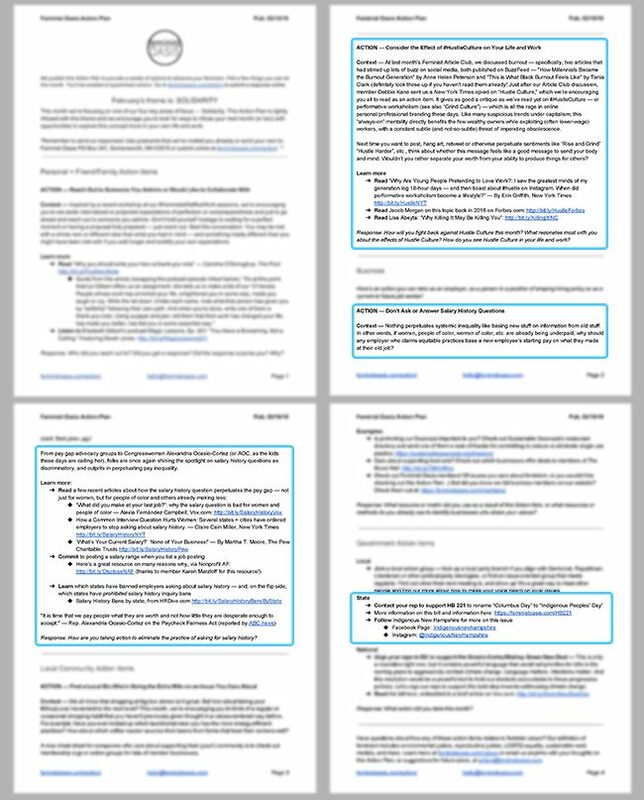 Members are emailed hyperlinked versions and some are mailed a printed copy of the full Action Plan with supplemental materials. We publicly publish an abbreviated version each month so that everyone can pick a few things they can do this month. If you take any of these actions, please send us a response to let us know how it went! *for the full version, become a member! Context — At last month’s Feminist Article Club, we discussed burnout — specifically, two articles that had stirred up lots of buzz on social media, both published on BuzzFeed — “How Millennials Became the Burnout Generation” by Anne Helen Peterson and “This is What Black Burnout Feels Like” by Tania Clark (definitely look those up if you haven’t read them already! Just after our Article Club discussion, member Debbie Kane sent us a New York Times op-ed on “Hustle Culture,” which we’re encouraging you all to read as an action item. It gives as good a critique as we’ve read yet on #HustleCulture — or performative workaholism (see also “Grind Culture”) — which is all the rage in online personal/professional branding these days. Like many suspicious trends under capitalism, this “always-on” mentality directly benefits the few wealthy owners while exploiting (often lower-wage) workers, with a constant subtle (and not-so-subtle) threat of impending obsolescence. Next time you want to post, hang art, retweet or otherwise perpetuate sentiments like “Rise and Grind” “Hustle Harder”, etc., think about whether this message feels like a good message to send your body and mind. Wouldn’t you rather separate your worth from your ability to produce things for others? Response: How will you fight back against Hustle Culture this month? What resonates most with you about the effects of Hustle Culture? How do you see Hustle Culture in your life and work? 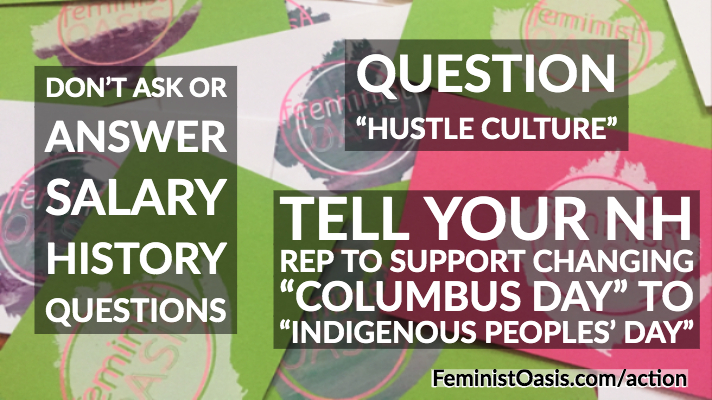 If you’d like to receive the full Action Plan with context, collected resources and action items, become a Feminist Oasis member!